I’m happy you were able to resolve and finish your post, Sara, and more than that, that you’re proud of being wired how you are. I live in this constant dichotomy of being equally terrified of and excited about uncertainty. I’ve always loved surprises, and there’s nothing more surprising than the uncertainty of the future, and who and what it holds. But I’m also a planner by nature and, well, the uncertainty of the future, and who and what it holds can rarely be planned for. I haven’t figured out how to rectify or at least accept that…it feels like I’m constantly punching myself and giving myself a massage at the same time. I also love that your post riffed off another’s. I do that myself and see others do it too, and I’m convinced there’s really only about a dozen blog posts that have ever been written in the entire world…the rest are millions of riffs off those dozen. I like that. Ah yes, it’s a strange dichotomy! Swings and roundabouts – I both enjoy spontaneity and crave security; want to enjoy unfettered movement and love stillness. Lol life’s a massage of punches indeed. Your post reminds me of two similar yet different ideas. In some ways, I live coatless; in other ways, I don’t. When it comes to writing, creativity, and related things, I open myself as wide as I can. I’m bound to run into setbacks and rejection as a result (especially when the time comes for manuscript feedback and agency queries), and not everyone agrees it should be the focus of my life (*cough* dayjob *cough*), but I love writing so much that it feels wrong to not pursue it and share that love with the world. With people, it’s a whole other story, probably because I’m a textbook introvert. I struggle with small talk and opening up to strangers unless I can find a common interest right away. And while I don’t mind attending social events, I don’t attend many because they drain and frustrate me because of my introversion – which in turn means I rarely meet new people. When I read messages like yours and Geisha’s, my first reaction is “This is what I *should* be doing, but I hit an internal brick wall each time.” Then I think about it again, and my second reaction is “I shouldn’t be so critical of myself. As long as I take off that coat when I’m in the right place, with the right people, under the right circumstances, I *am* doing it. 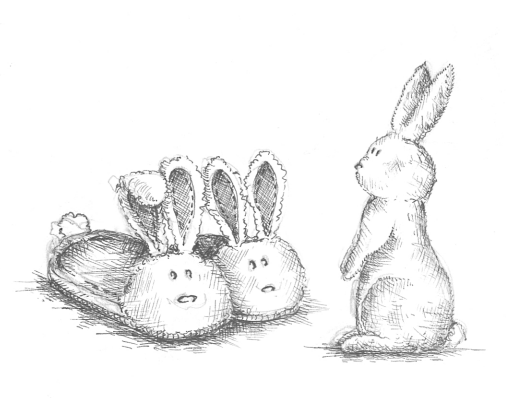 I just can’t forget to do it, that’s all.” And that’s the point for some of us: To remember to kick off the bunny slippers and unbutton the coat so we can open ourselves up to more love and warmth (and the occasional cold and rejection) every now and then. No one likes the cold, but every winter is followed by spring, right? I completely understand – I make an effort to be open when it comes to writing and creativity, but that’s a choice. It’s more of an effort there to invite open up and pour it out and invite rejection, because it would be easy not to; it would be easy to shield yourself from it. When it comes to the heart, it isn’t so much a choice. I’m happy to be coatless.. Somehow, whatever happens, whoever hurts me, I remain that way. And I’m glad. But there is no *should*, I agree that it’s worthwhile to make a point of remembering – remembering what’s possible when we allow ourselves sometimes to get out the way of ourselves and just let it be. It’s uplifting to hear you’ve weathered your recent storms, Sara, and discovered that within were the components needed to enrich your life despite the pain caused. Your outlook with serve you well, not just because moving forward becomes less fearful, but because you recognize how even pain is a building block in our growth as individuals. I’ve no desire for a charmed life, for refusing to see uncertainty merely strengthens its impact. That’s my head talking, though, for my heart has long wore her coat. I came into this world coatless to discover the sun unrelenting in its desire to burn and the air frigid in its disregard for my welfare. That sounds dispirited, I know, for that was long my outlook. In recent times I’ve longed for the coatless life so long denied. We’ll see. Thank you Christina, I think it’s important to move forward at all and not stall; it would be so easy to spiral. Ah, it doesn’t sound dispirited, but poignant. If you long for the coatless life for yourself then I long for the weather to improve for you so the future holds nothing but summer. So glad to hear Scarfgate is resolved! I hope you are going to have a party to celebrate Night Butterflies overcoming all these hurdles and crossing the line – or at least open a bottle of bubbly with a friend. That is a great quote, and so true. I love Madeleine L’Engle, especially her Wrinkle in Time! Thank you! Ah, I’ve just hit Go finally.. And do you know, with everything, I don’t even have bubbles or friends on standby. How awful is that, with everything I keep saying about trying to live in the present. I’ll definitely take a moment at some point… Stupid as it sounds, thank you for reminding me – I really mean it! My coat is completely unbuttoned.